705 olive building - B.E.L.T. 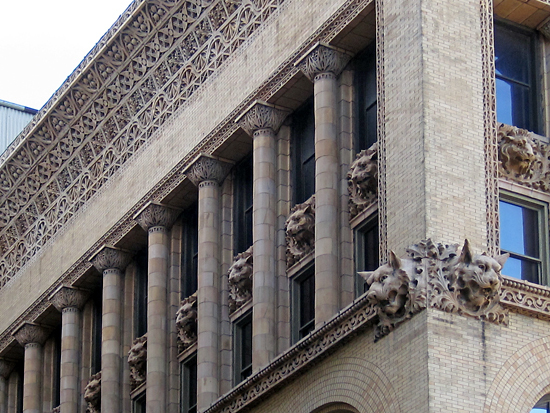 St. Louis has an 1893 Louis Sullivan and Dankmar Adler building on the National Register, the Wainwright Building, which ranks as either the first or second (depending on whose counting) skyscraper built. Not as well known (even to my Architectural History & Theory teacher in college!) is that we have a second Sullivan & Adler building that survives to this day. 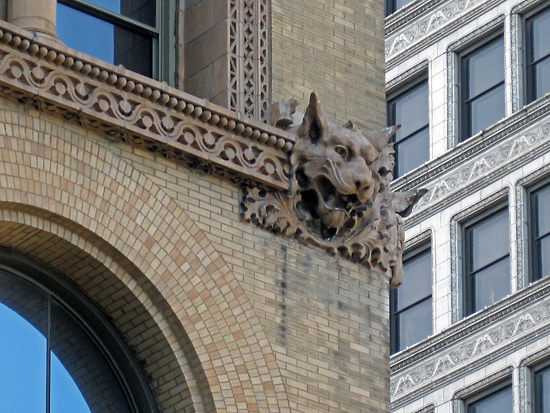 On the northwest corner of 7th & Olive is the building which was designed as the Union Trust Building. Starting in 1902 it began a series of name changes: St. Louis Union Trust, Missouri Trust, Central National Bank, Lincoln Trust, and finally, to the name on its National Historic Landmark plaque, The 705 Building. It also went through some serious remodeling, including a 1905 addition by Eames & Young on the north end of the building. But the most heinous crime was a 1924 remuddle which scrapped off the exterior of the first two floors. Here’s what it looked like from 1893 to about 1923. 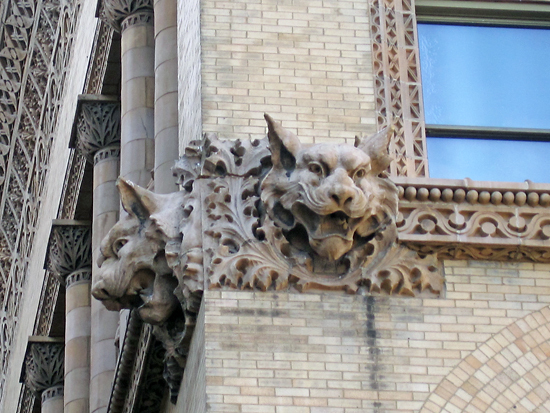 Aside from the circular windows that still survive on the alley side of the building, the upper 13 stories have remained intact, including the lions shown above. Typically, I dislike parking garages. But when the roof of a parking garage puts me this close to my beloved lions, then I really dig this parking garage, and don’t mind having had to pay $5 to use it! To the right in the above photo is the Railway Exchange building, where I worked for Famous Barr advertising for 13.5 years. For half that time, we were on the 8th floor, and the Advertising President’s office looked down on these two lions. The the fool sat with his back to them! When he was out, I’d sneak into his office to gaze lovingly at them; they were both inspirational and a sedative for deadline stress. They also got me in trouble when I was caught hanging out the President’s window with a camera, trying to get a shot without a dirty window between me and the lions. And now 10 years later, a parking garage that I was forced to use on a Sunday afternoon has given me the closest, clearest access to all the lions. It was the best kind of September Sunday St. Louis Serendipity!